Community car washes: Here in Wasilla, it can be difficult to find a high quality car wash, and if you lack the ability or time to do it yourself, that can be a big issue. 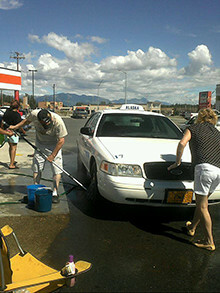 Fortunately, Alaska Cab Valley, LLC is happy to host regular community car washes throughout the year. Give us a call anytime to find out when and where our next car wash will be. Veterans welcome: As a business providing taxi transportation in Wasilla, AK, we know that hard work, dedication and respect are the key to success. Those traits are also the admirable qualities shared by our military veterans. We are proud to welcome veterans as both employees and customers of Alaska Cab Valley, LLC. Get in touch to learn more about how we support veterans in our area. Honest and respectful: Unfortunately, it can sometimes feel like basic principles like transparency, honesty and respect are now too “old fashioned” for modern businesses. Here at Alaska Cab Valley, LLC, we still consider the old fashioned way to be the best way, which might be why we’ve been voted Best in the Valley over 10 times in the last 15 years. If you would like to learn more about our community outreach efforts, or if you have a suggestion for a new way for us to get involved, please give Alaska Cab Valley, LLC a call at 907-357-2727, or visit our Contact Us page.